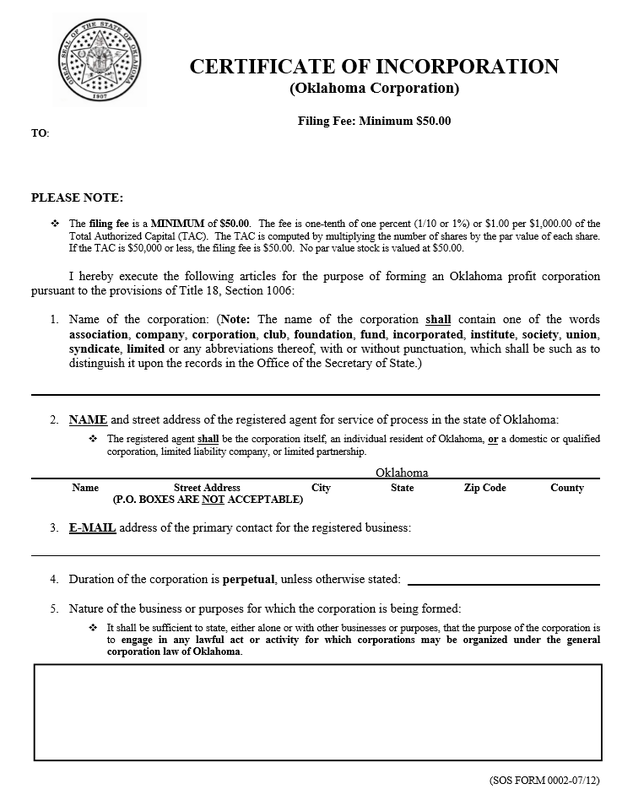 The Oklahoma Articles of Incorporation of a Forprofit Corporation must be submitted by Incorporators to the Oklahoma Secretary of State before their corporations may conduct business legally in this state. You will need to calculate the Filing Fee that must be submitted with this application. 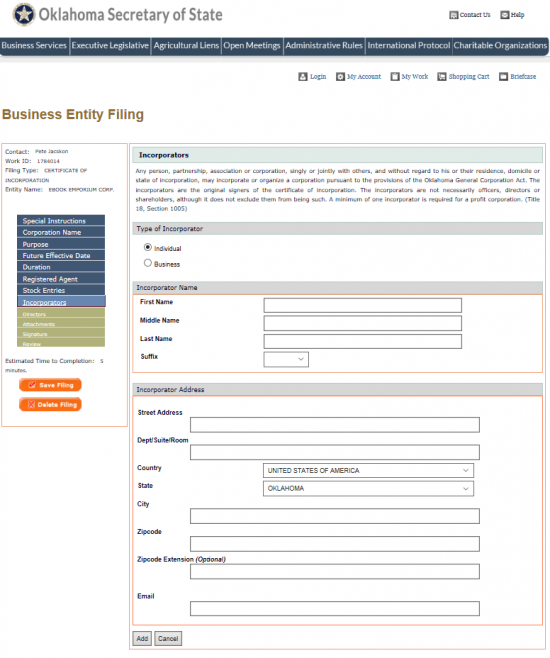 This will be done by taking the total authorized captial for the corporation being formed. 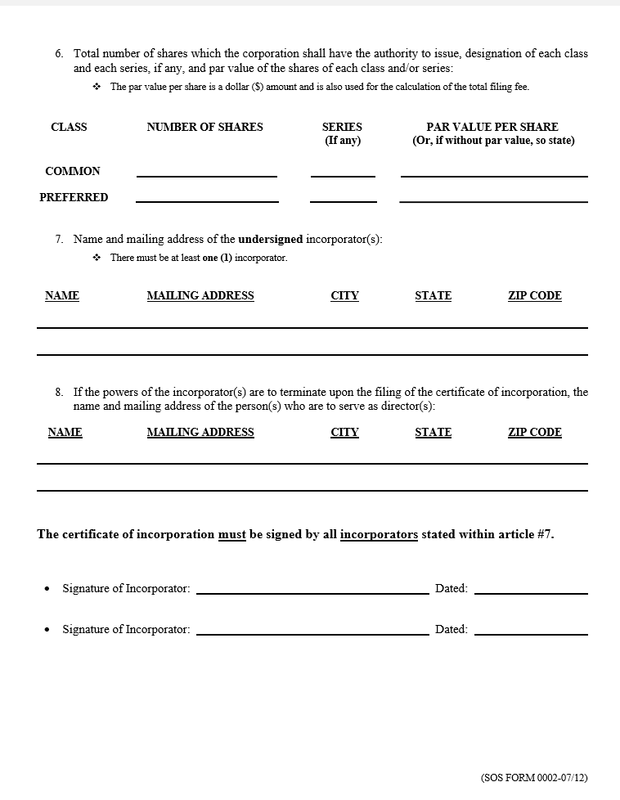 The Total Authorized Capital is the total number of shares multiplied by the par value of each share. The Filing Fee will be one tenth of one percent of this number. This fee may not be less than $50.00 and if the TAC (Total Authorized Capital) is greater than $50,000.00 the fee will be $1.00 per $1,000.00. 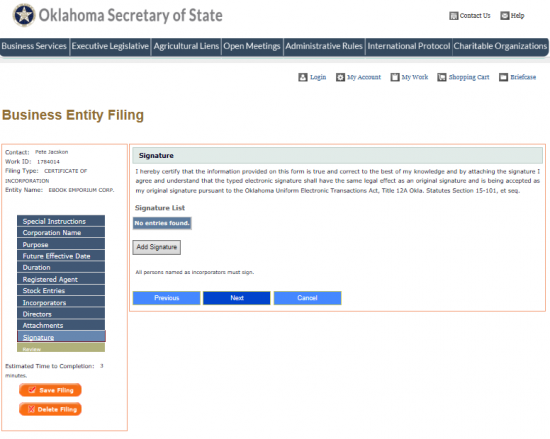 It is worth noting that not all entity types will fulfill the requirements of reporting to the Oklahoma Secretary of State with this form. 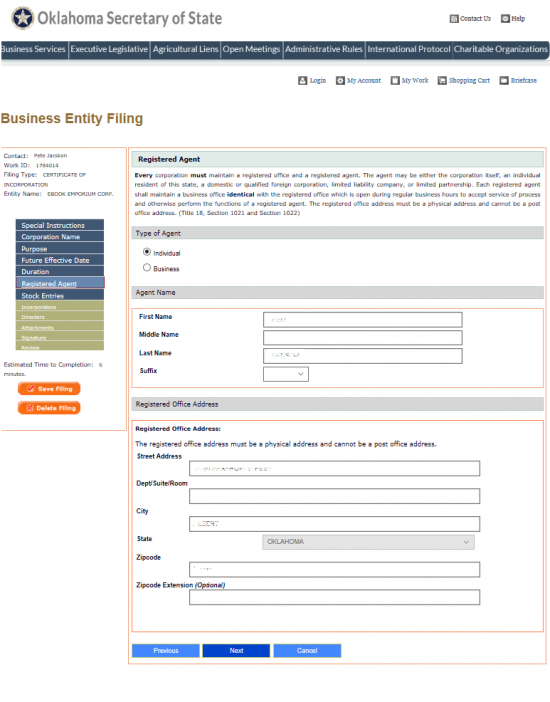 Additional filings and documents may need to be submitted simultaneously or beforehand. Incorporators are thus encouraged to complete their due diligence in research before filling out this form. 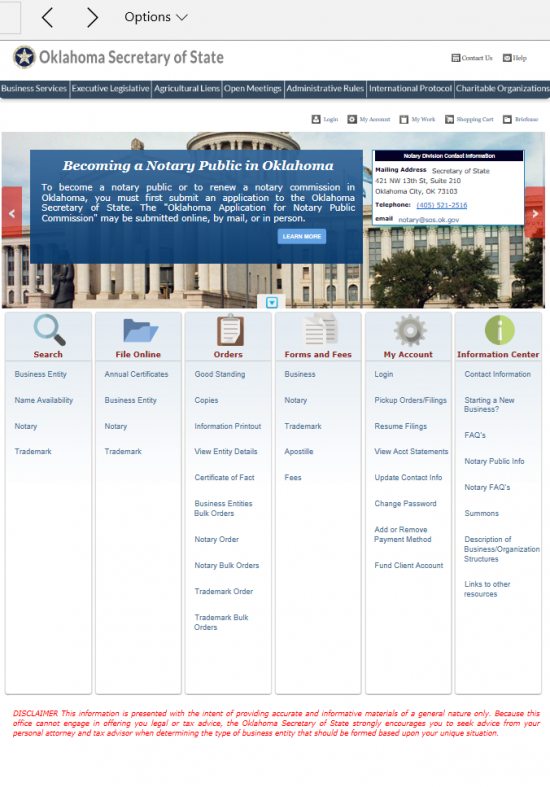 Step 1 – Download the Oklahoma Articles of Incorporation by selecting the link above. Whether you are using a PDF program or have printed it to fill it out, you must completely answer all the sections. Thus, if printing it out make sure to continue any sections where there is not enough room on a separate document that is clearly labeled. 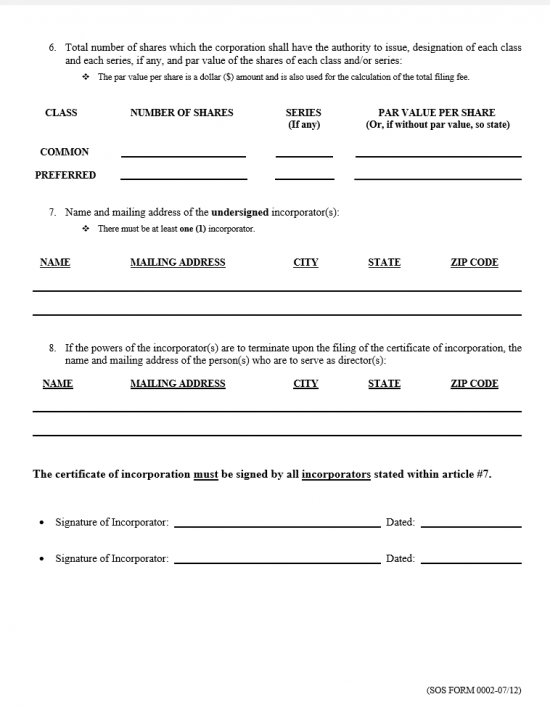 Step 2 - Enter the Full Name of the profit corporation being formed in Article 1. 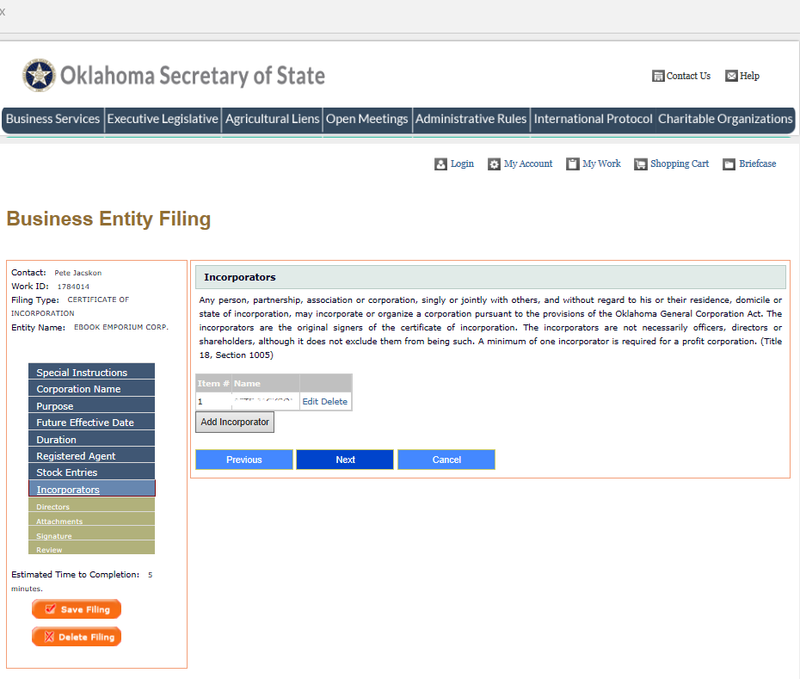 Step 3 - In Article 2, there will be a blank line with several labeled sections: Name, Street Address, City, State (filled out for you), Zip Code, and County. 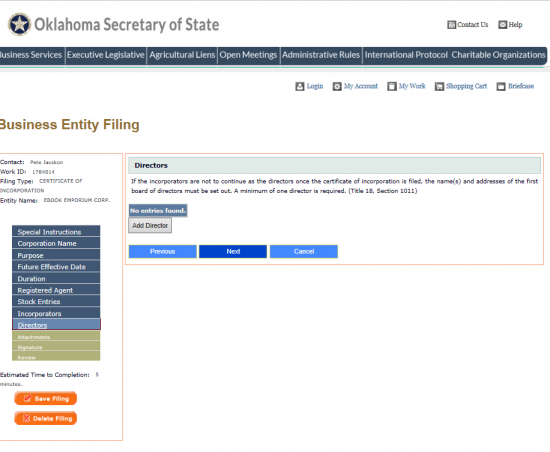 You must report the Identity and the Full Address of the Registered Agent you have obtained for your corporation. Note: This address may not contain a P.O. Box. 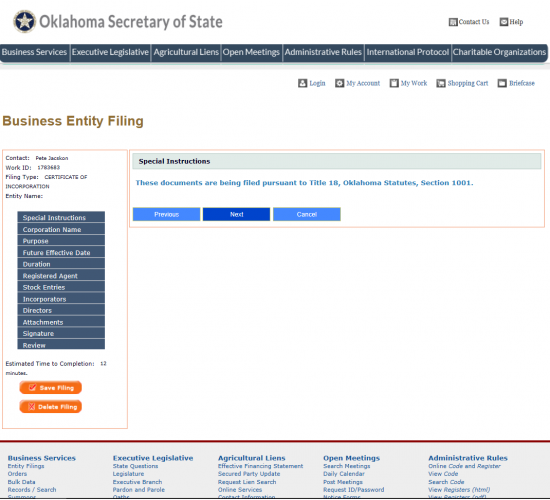 Step 4 - In Article 3, enter the E-Mail Address of the primary contact for the corporation being formed that may be used to reliably contact this corporation. Step 5 - In Article 4, if this corporation does not plan on operating indefinitely then enter the number of years until it terminates. Step 6 - In Article 5, report the Purpose for the formation of this corporation in the box provided. 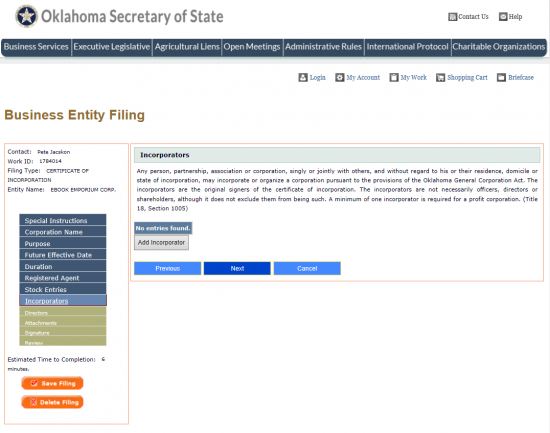 You may simply write “to engage in any lawful act or activity for which corporations may be organized under the general corporation law of Oklahoma.” You may write this in addition to a specific purpose, without any additions, or you may leave it out and write the Purpose without this sentence. 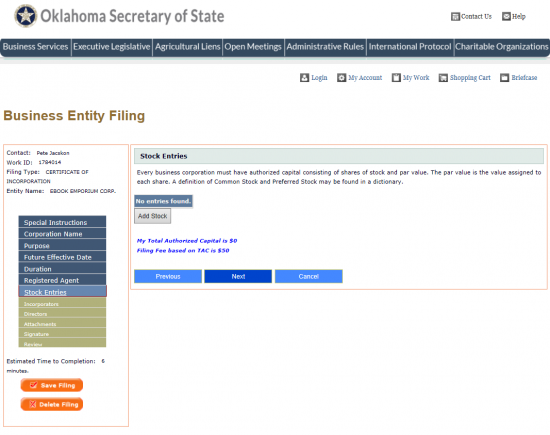 Step 7 - In Article 6, you will need to report the total Number of Shares, Series (if any), and Par Value Per Share (Or, if without par value, so state) for each Class of stock. There will be a table provided where you may do this. 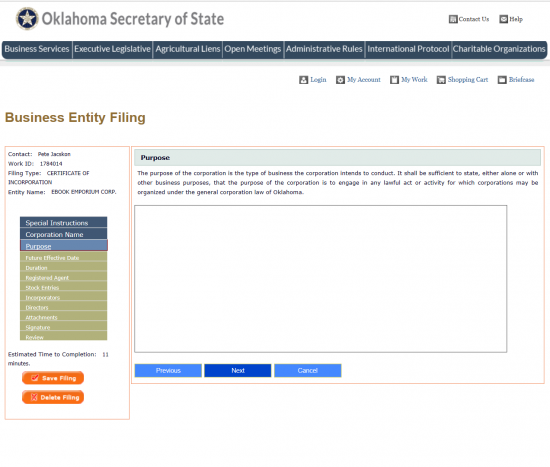 Step 8 - In Article 7, report the Full Name and Full Address of each Incorporator in the space provided. Step 9 - Under some circumstances, the powers of the Incorporators of a corporation terminate at the time a Certificate of Incorporation is gained. If this is the case, you will need to report the Full Name and Full Address of each Director serving on the Initial Board of of Directors. Step 10 - Next each Incorporator named in Article 7 will need to Sign his/her Name and provide the Date of that Signature. Step 11 - Calculate the Filing Fee for these articles by multiplying the number of shares by the par value of each share. This will give you your total authorized capital. Your Filing Fee for this corporation will be one tenth of one percent of the total authorized capital. The minimum Filing fee is $50.00. If the TAC is greater than $50,0000, then you must pay $1.00 for every $1,000. Note: For the purposes of calculating the Filing Fee, value no par value stock as $50.00 per share. 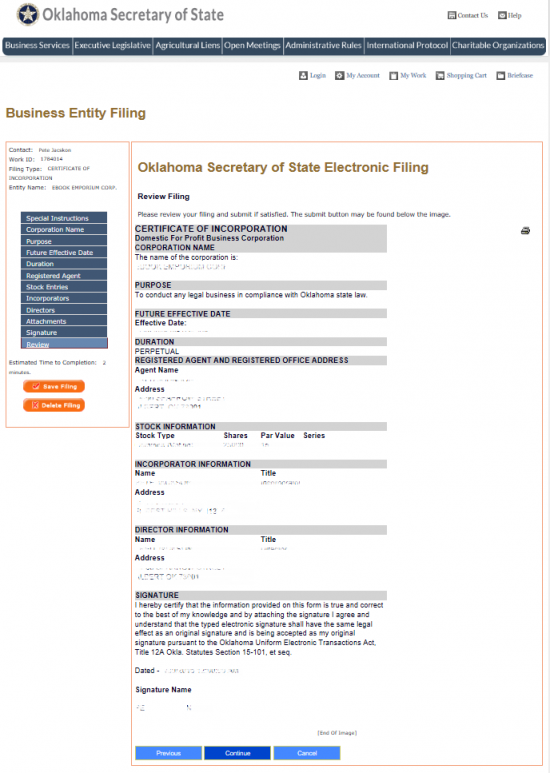 You must pay the filing fee with a check made out to the Secretary of State. Step 4 - If you do not have an ID with this system you will be asked to create one. 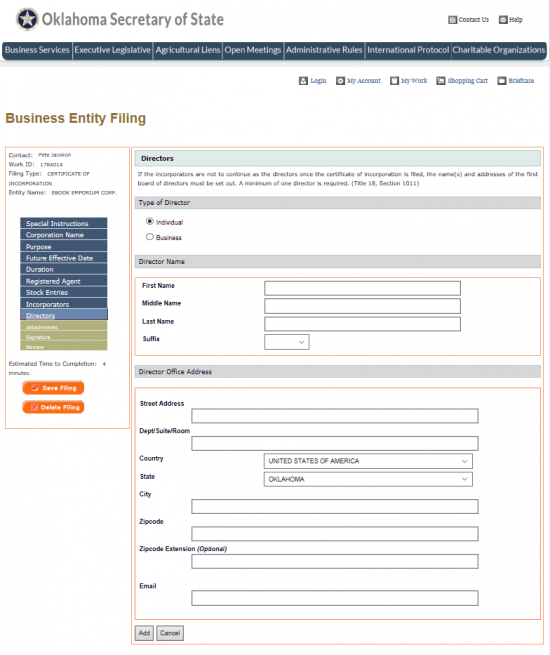 Select the button labeled “Start New” from the first page of this form process. 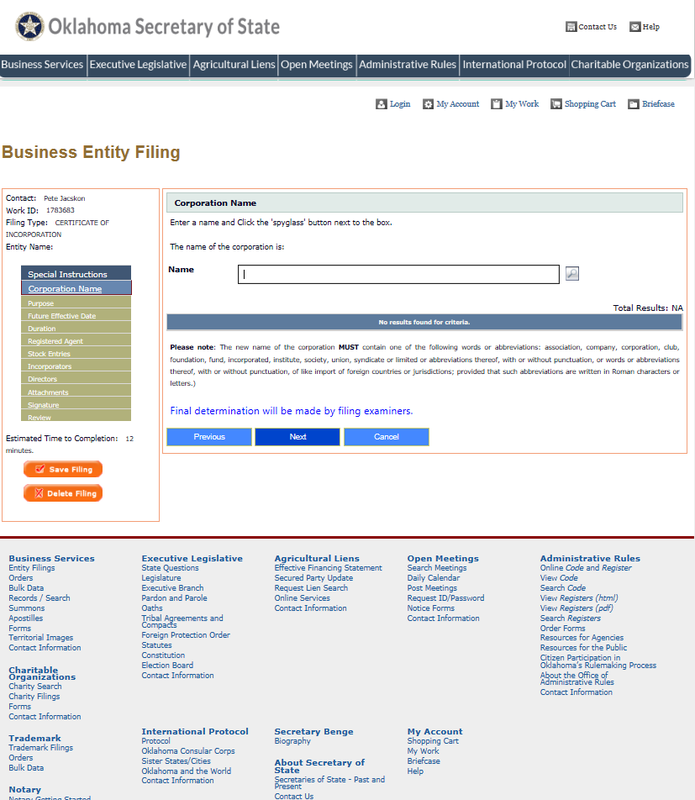 Step 7 - On this page, report the Purpose of corporation you are forming in the text box provided. This should be a statement or two regarding why you are forming this corporation and how it will conduct its business. Step 11 - Under the heading “Agent Name,” locate the fields labeled “First Name,” “Middle Name,” “Last Name,” and “Suffix.” Use these fields to report the Full Name of the Registered Agent. 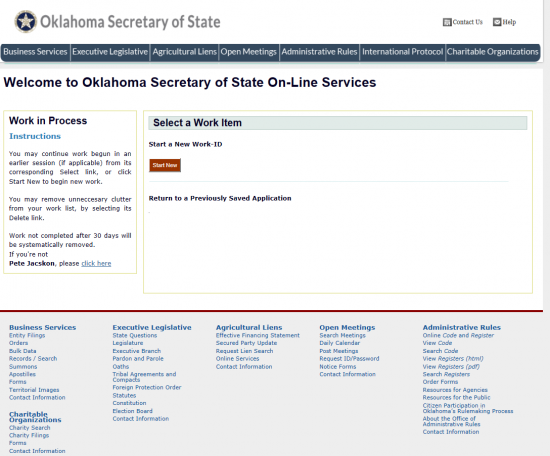 Step 12 - Under the heading “Registered Office Address,” use the fields labeled “Street Address,” “Dept/Suite/Room,” “City,” “Zip Code,” and “Zip Code Extension (Optional)” to report the Full Address of the Registered Agent’s Registered Office. 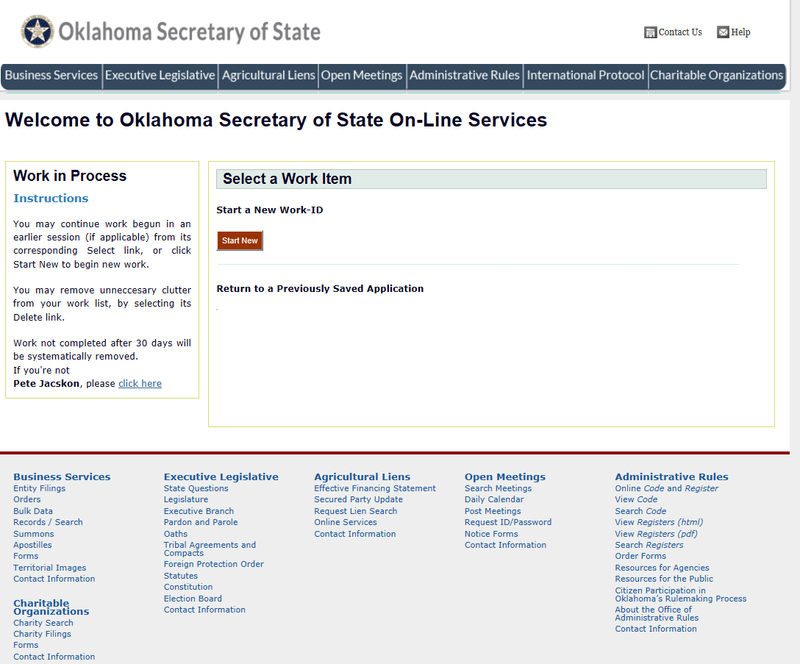 Notice that “State” is filled out already. Once you are done select the button labeled “Next.” Step 13 - On the Stock Entries page, you will need to define the the Total Authorized Capital for this corporation. 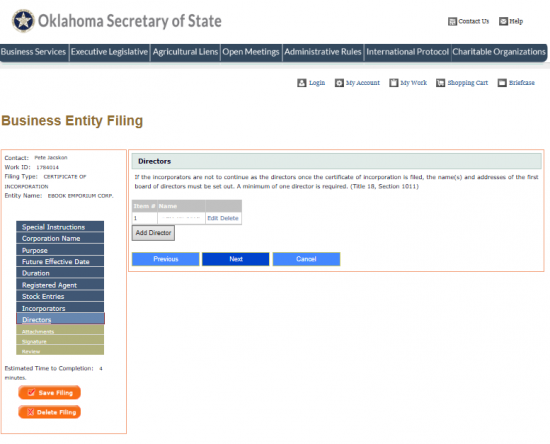 This will be used to determine your filing fee. To begin, select the button labeled “Add Stock.” This will guide the browser to a page where you may enter your information. Step 14 - There will be several fields requiring attention. Locate the first field labeled “Stock Type.” This is a drop down list which you may select your stock type from. Step 15 - Next, in the field labeled “Number of Shares,” enter the Total Number of Shares for the Stock Type you are defining. Step 16 - In the field labeled “Par Value (Or, if without par value, enter 0)” enter the value of each share in the class you are defining. If there is no par value enter a zero. 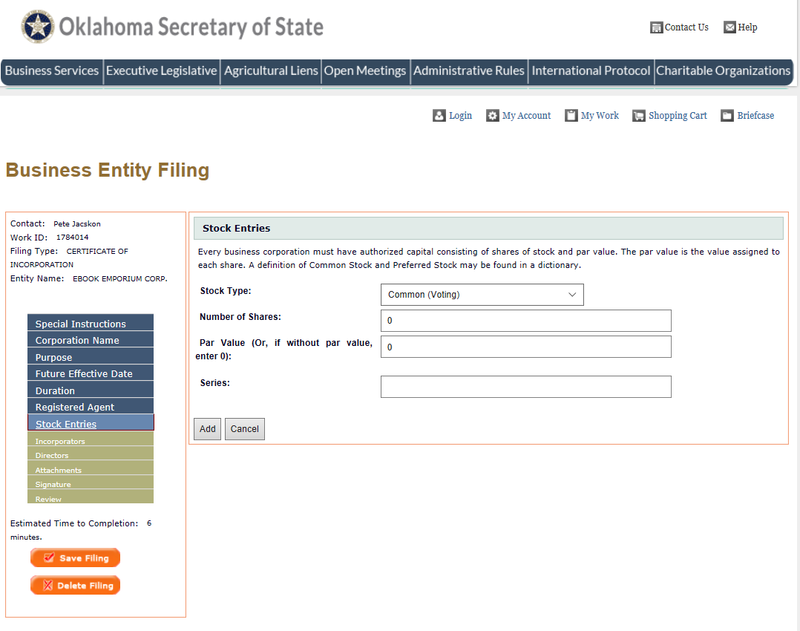 Step 18 - The Stock information you have entered will be displayed in a table in the Stock Entries page. 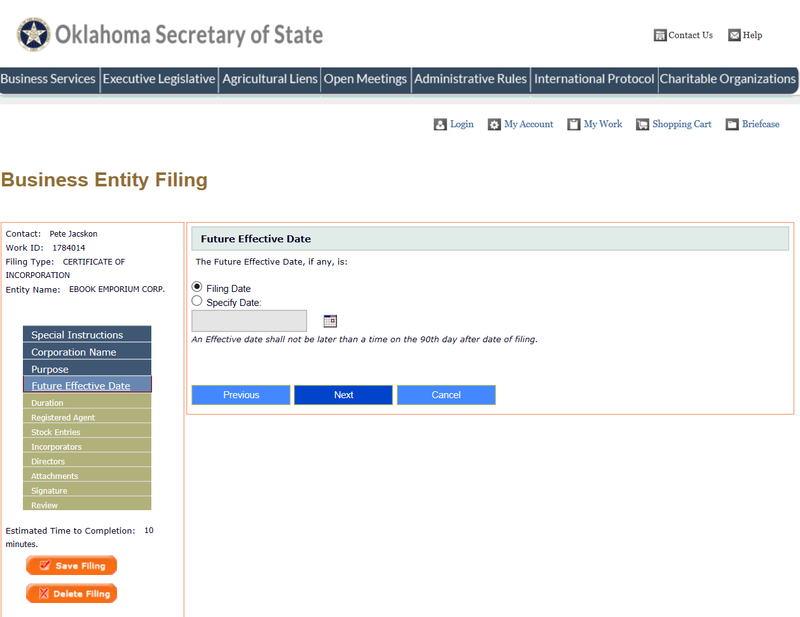 Notice the Filing Fee will be displayed directly below this table. Review this information. If it is incorrect, you may select the “Edit” or “Delete” button at the end of this row. If you wish to add other stock information select the button labeled “Add Stock.” Once you have entered all the information, select the “Next” button. Step 19 - Next, on the Incorporators page, select the “Add Incorporator” button to enter information regarding the Identity and Address of each Incorporator. You must report all the Incorporators of this corporation. This will direct the browser to a page where you may enter this information. Step 21 - In the “Incorporator Name” section, use the fields “First Name,” “Middle Name,” “Last Name,” and “Suffix” to report the Identity of the Incorporator you are documenting. 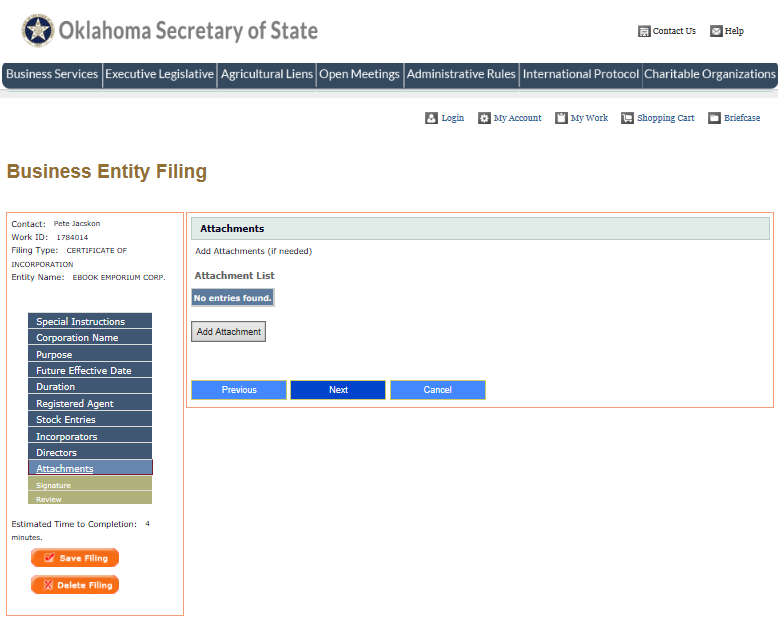 Step 23 - This page will display the Incorporator you entered in a table. You may use the “Edit” and “Delete” buttons at the end of each row to edit or delete the Incorporator entry. Use the “Add Incorporator” button report any additional Incorporators. Once you are done select the “Next” button. Step 24 - Next, on the Directors page, you will need to enter the Identity and Addresses of each Director (should the Incorporator’s power cease upon a successful filing of this form). 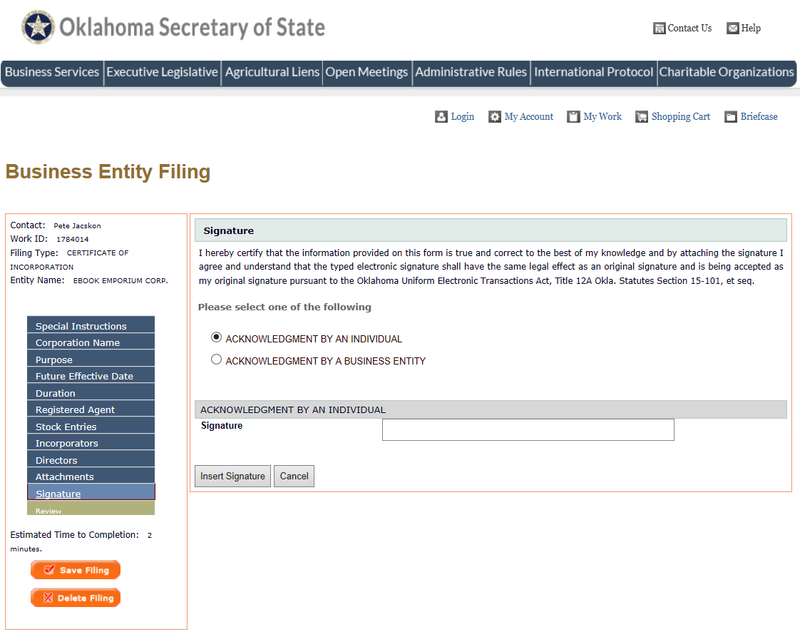 For our purposes, assume the Incorporator’s powers will cease upon formation and select the “Add Director” button. Step 26 - Use the “First Name,” “Middle Name,” “Last Name,” and “Suffix” fields under the Director Name heading to report the Name of a Director. Step 28 - This page will give you an opportunity to Edit the Director information you entered, Delete it, or Add another Director. Use the buttons provided to perform any of these actions. When you are ready select the “Next” button. Step 29 - On this page, you have the opportunity to include any attachments with this filing by selecting the “Add Attachment” button to locate the file on you machine then upload it. Once you are done, select the “Next” button. Step 31 - The first section of this page will require that you indicate if you are an individual or a business. If you are an individual select the radio button labeled “Acknowledgement by an Individual.” If you are a Business, select the radio button labeled “Acknowledgement by a Business Entity.” For our purposes select the first radio button. Step 33 - This page will display the Signature party in a table. 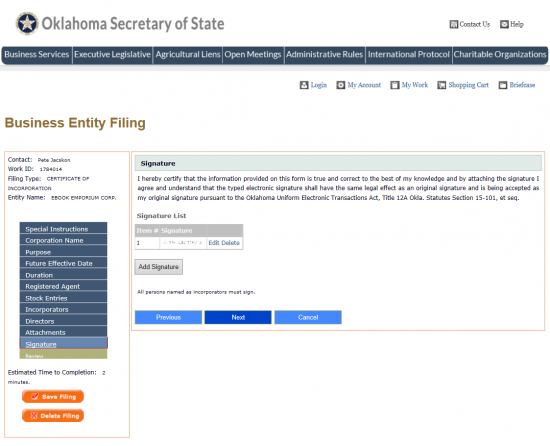 All Incorporators must provide an Electronic Signature. Once each one has you may select the “Next” button. Step 34 - This will be a review page where you may review all the information you have entered. 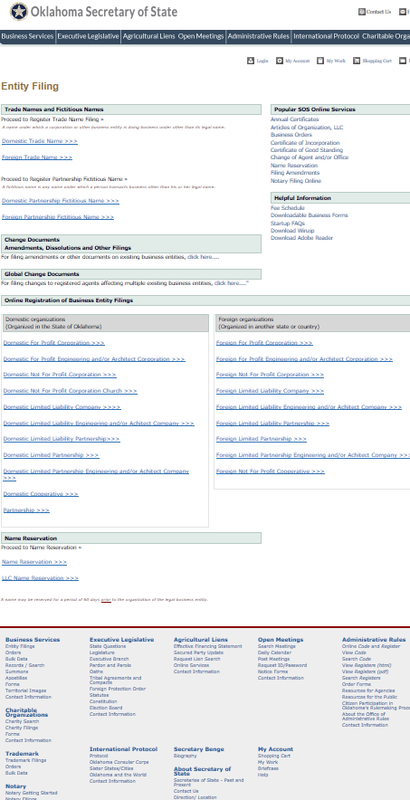 You may use the Section Titles listed on the left to navigate to any area needing correction. Once you have verified all information is correct, select the “Continue” button. This will direct you to the payment area where you may enter your credit card information for payment of the Filing Fee defined in the Stock Information section.